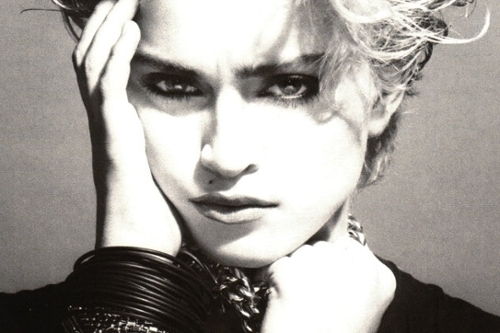 Thirty-five years ago, we had the pleasure of making the acquaintance of one Ms. Madonna Louise Ciccone, a hot young thing with a sultry pout, thick eyebrows to match, and a way with a post-disco dance beat that made us feel so good -- and SO bad -- all at once. That’s right: Madonna’s self-titled debut album turns 35 (and yes, that means we are all very old). But hey, that also means we’ve had the pleasure of spending 35 years in Her Madgesty’s presence, reveling in all her glorious highs (“Vogue!”, Confessions on a Dancefloor) and her infinitely watchable not-so-highs (the movies). And we’re old -- er, worldly -- enough to remember ‘em all. So to honor just how far we all have come together, we’re celebrating the 35th anniversary of Madonna with a playlist of 35 of Madonna’s greatest hits. Diving deep into her highly influential (and highly influenced) 1983 debut. From MJ to Madonna, Duran Duran to Whitney Houston, George Michael to Prince.